Since 2014, U.S. shale oil has created a boom in domestic crude oil production. Shale oil comprises more than a third of the onshore production of crude oil in the lower 48 states. It drove U.S. oil output from 5.7 million barrels per day in 2011 to a record 11.6 million barrels a day in 2018. 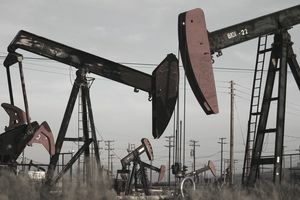 As a result, the United States became the world’s largest crude-oil producer, according to the Energy Information Administration. The U.S. oil industry has found the right balance. It's increased the supply slowly enough to maintain prices that pay for more exploration. Thanks to shale oil production, U.S. reliance on foreign oil imports has plummeted. U.S. production meets 58 percent of 2017 domestic demand of 19.96 million barrels per day, according to the EIA. That's down from 45 percent in 2011 and a whopping 60 percent in 2005. The EIA projects foreign oil will only account for 34 percent of U.S. oil by 2019. In November 2018, this increased supply sent U.S. oil prices into a bear market. The price of a barrel of West Texas Intermediate fell 20 percent from its October four-year high of $76.41 a barrel. Inventories rose to a five-month high of 432 million barrels. Oil prices are volatile due to commodities traders. They trade oil futures contracts at an auction similar to the options market. That mentality can make them bid prices up during a shortage and bid them down during a surplus. The history of oil prices showed that in 2008. They created an asset bubble, driving prices up to $145 a barrel in July. By December, they had bid oil prices down to $35.59 a barrel. Commodities market trading was one of the reasons for the shale oil boom and bust. Two factors drove the U.S. shale oil boom. First, oil prices averaged above $90 a barrel for three years, from 2011 to 2014. That was enough to allow shale exploration and production to be profitable. Second, low-interest rates gave banks and private equity investors a strong incentive to lend to shale oil companies. The total amount of loans was almost $250 billion in 2014. The sudden jump in oil production created an oversupply that sent prices plummeting. Prices for West Texas Crude fell from $106/barrel in June 2014 to $32/barrel in January 2016. That's almost as low as the bottom during the Great Recession. The price was $30.28 on December 23, 2008. Shale oil producers kept drilling. They became better at cutting costs the more they drilled. Their bankers kept rolling over their debt as long as interest rates remained low. Many producers had previously sold their oil at higher prices on the futures market. That hedged their income. To maintain market share, OPEC also kept pumping oil. Normally, it would cut production as oil prices fell. That situation could not continue for long. Banks used oil reserves as collateral. As oil prices fell, so did the value of the collateral. As a result, many drillers became "upside-down." The same thing happened to many homeowners during the subprime mortgage crisis. As a result, drillers didn't add rigs as fast as they previously did. In December 2015, the Fed began raising interest rates. Lenders became less willing to roll over debt. As a result, many shale companies desperately pumped enough oil to make their monthly debt payments. They did this no matter how low prices got, even sacrificing profitability. Smaller companies, such as Sandridge Energy Inc., Energy XXI, and Halcón Resources, used 40 percent of revenue in 2015 to make monthly payments. Eventually, low prices caught up with the industry. Many stopped drilling. In October 2015, about half were sitting idle. Dozens filed for bankruptcy, and 55,000 workers were laid off. On January 20, 2016, oil prices fell to a 13-year low of $26.55/b. But the EIA accurately predicted that oil prices would rise again in time. The Bakken Field in North Dakota and Montana is the largest producing shale oil reserve. The field has layers of dense, oil-bearing rock about two miles underground. The field is roughly the size of West Virginia and, as of December 2012, produced 770,000 barrels of oil a day. Although production started to take off in 2006, levels doubled by 2014. Horizontal wells provide 95 percent of production. As a result, North Dakota extracts more oil than Alaska. It's closing in on the 2 million barrels a day produced by Texas. In 20 years, its number of wells could increase from the current 8,000 to at least 40,000. Part of the reason for expansion is that each well runs dry after about two years. Oil is trapped in pockets that don't hold as much oil as traditional wells. But in total, the field could contain almost 4 billion barrels of shale oil. As of 2011, the Eagle Ford field in Texas produced 750,000 barrels/day, almost all from horizontal wells. The U.S. Geological Survey estimates there are 853 million barrels in undiscovered reserves. Drillers are searching for both oil and natural gas. The Utica field in Ohio has anywhere from 1.3 and 5.5 billion barrels of oil. Ohio is currently producing 5 million barrels of oil a year. So far, the oil reserve is still being explored. The largest U.S. reserve is the Monterey Shale formation near Bakersfield, California. It has four times the oil as the Bakken Field in North Dakota. Its 1,750-square-mile area contains 15.4 billion barrels of oil. It's about two-thirds of the nation's total shale reserves. But the California shale oil is much more difficult to extract than the Bakken. Its geological formation requires more intensive fracking and deeper horizontal drilling. That's a concern in a state that lies on the San Andreas fault. It already gets more than its fair share of earthquakes. As a result, environmental groups are adamantly opposed. Will Kerogen Make America an Oil-Exporting Nation? What's the "Right Price" for Oil? Is U.S. Nuclear Power the Answer to Climate Change?